Click beetles, as you might suspect, are named for the clicking sound they produce. These entertaining beetles belong to the family Elateridae. Click beetles are usually black or brown, with some species bearing red or yellow markings. 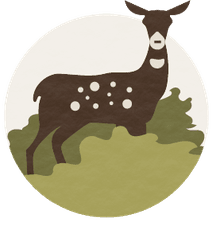 Most fall within the 12-30 mm range in length, though a few species can be considerably longer. They're easiest to recognize by shape: elongate, parallel-sided, with rounded front and hind ends. A click beetle's pronotum has pointed or spiny extensions at the posterior corners, which fit snugly around the elytra. The antennae are almost always serrate in form, though some may be filiform or pectinate. Click beetle larvae are often called wireworms. They're slender and long, with shiny, tough segmented bodies. Wireworms can be differentiated from mealworms (darkling beetle larvae) by examining the mouthparts. In the Elateridae, the larval mouthparts face forward. The eyed click beetle, Alaus oculatus, bears two enormous false eyespots on its pronotum, most likely to deter predators. 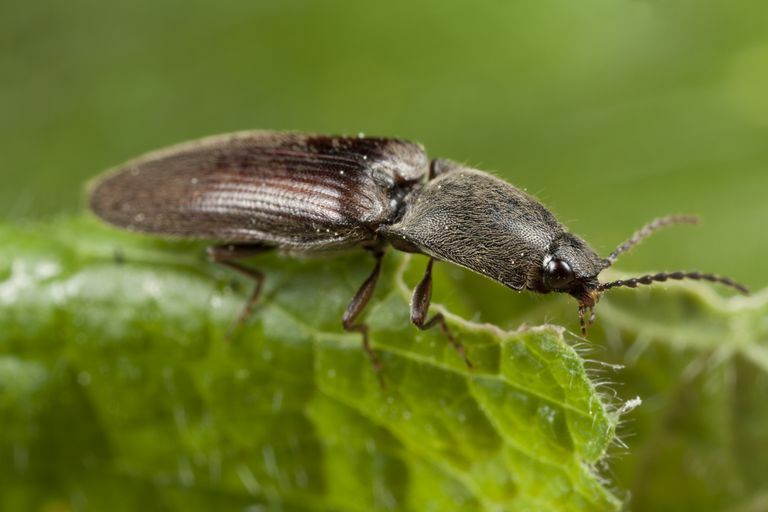 Adult click beetles feed on plants. Most larvae also feed on plants, but they tend to prefer newly planted seeds or plant roots, making them a pest of agricultural crops. Some click beetle larvae inhabit decomposing logs, where they hunt other insects. Like all beetles, members of the family Elateridae undergo complete metamorphosis with four stages of development: egg, larva, pupa, and adult. Females usually deposit eggs in the soil around the base of host plants. Pupation occurs in the soil or under bark, or in some species in rotting wood. Overwintering occurs in the larval and adult stages. When stranded on its back, a click beetle has an unusual way of righting itself to flee from danger. The juncture between the prothorax and mesothorax is flexible, enabling the click beetle to do a backbend of sorts. This movement allows a special peg, called the prosternal spine, to fit into a catch or hold between the middle pair of legs. Once the peg is secured in the hold, the click beetle suddenly straightens out its body, and the peg slips into a mesosternal groove with a loud click. This motion hurls the beetle into the air at a speed of roughly 8 feet per second! Some species in the tropics have a special light organ which they use to communicate with potential mates. The click beetle's light burns much brighter than that of its cousin, the firefly. Click beetles live throughout the world, in nearly every terrestrial habitat except for the most extreme montane and arctic environments. Scientists have described over 10,000 species, including almost 1,000 in North America. Family Elateridae - Click Beetles, Bugguide.net. Accessed online June 4, 2012. Elateridae, South Dakota State University. Accessed online June 4, 2012. BioKIDS - Kids' Inquiry of Diverse Species, Critter Catalog, Elateridae, click beetles. Accessed online June 4, 2012.